Well, what can I say? That was quite the ride. I had fun turning these posts into a relapse to my own eighth-grade syndrome days with excerpts from the Poetic Edda. It feels like forever since I went through that last. I hope you had fun reading them. For most weeks, the posts on the UTW and rori sites were different, with a theme to match the episode, often a conversation. Might be fun to go back and check what they were. If they inspire an interest in Norse Mythology in you, even better. But “relapse” might not be the right word. I never really got over my eighth-grade syndrome. My colleagues and co-workers think I’m insane when I suddenly act out a scene, do some improv, make references to Norse mythology, or any of my other strange mannerisms. No one gets over eighth-grade syndrome. We live it all our lives. We enjoy it all our lives. A word of advice for the young ones in the audience: You still have time to get infected. Do it, and never let your life be boring. yoji (TLC): Thanks for sticking with us on the search for the Unseen Horizon. I shall leave you with these words: Reality, be rent! Synapse, break! Vanishment, this world! Ioryogi (Editing): There was rarely a dull moment in the show. Week after week, Kyoto Animation gave us characters that were fun to watch and, more importantly, very easy to sexualize. Honestly, Comiket 83 can’t come soon enough. Sutai (Typesetting): This show just proves that the best girl never wins. A moment of silence for Nibutani. Bungles (Typesetting): I have no idea what this show is about. archdeco (Timing): Here we are, at the last station. I must say I really enjoyed the show, but that’s not surprising. After all, it’s KyoAni. What could go wrong? Here’s to the second season. But before that, there’ll be some additional BD only specials. See ya till then. Thanks to the whole team, especially fotc and Ioryogi. P.S. Special thanks to gg. With or without you, we would’ve subbed this show. Raze (QC): I had fun following Chuu2, though my involvement in the project has been limited to quick QC passes for the middle few episodes or so due to this show airing during the week. Props go to the team for doing a great job, and thanks go to you for choosing us for this series! Rem (QC): Dekomori best girl. Thank you for watching to the Final Vanishment. And yes, it is actually “Vanishment”. A really nice and beautiful ending for a really great show. If someone(like me) wants to know who did the narration at the end, it was by Hōchū Ōtsuka. Credits to windows IME pad and japanese wikipedia. Thx for subbing this anime: it *is* simply outstanding! …I think I just died of laughter. I agree; I don’t think anyone is able to get rid of the eight-grade syndrome. Every now and then I still pretend to be Satoshi from Pokemon and wave my broom around as if I’m Thor, ready to penetrate the world with white light. Just yesterday, during finals, I was eating a candy cane and I sharpened one end so I could wave it around and pretend to be someone from Harry Potter (and that inspired a wand battle with my friends). To be honest, I never expected Chuu2 to be so good. I started watching because of CV Fukuyama Jun and this is probably the first anime that really surprised me with its plot and characters. Now that it’s over, I can indeed safely consider this show one of the best to come out this year. Likable, characters, good comedy (while the comedy lasted), good character development to replace said comedy and good attention to detail surrounding it all. Final assessment: high beta tier (and that’s a compliment, because I’m extremely stingy with alpha tier rankings). 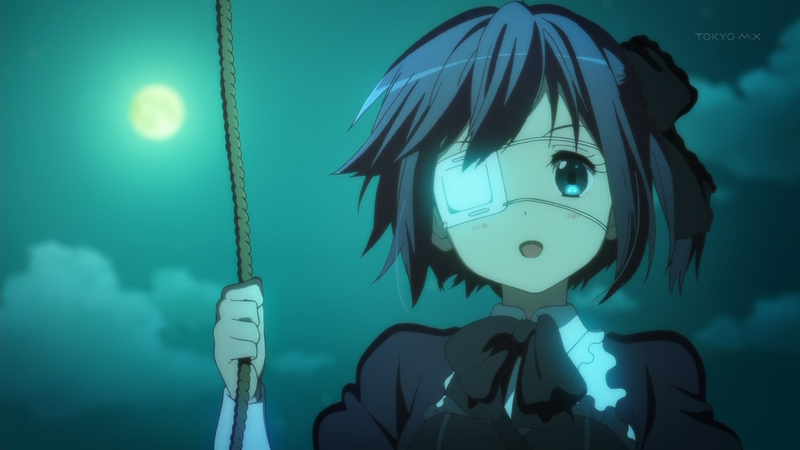 One minor nitpick, just because I can’t help myself… In that scene where Rikka jumps into Yuuta’s arms, I would just like to point out that Yuuta was standing on a slanted rooftop. Either Rikka is made out of cotton and paper tissue, or Yuuta has solid steel anchoring in his feet or they should both have tumbled off the roof. how dare you doubt the Dark Flame Master!? The Tyrant’s Eye is the ultimate buff. that said, are they making OVA’s? That Dekomori normal-mode. I love it. [a] Thanks for subbing this show! [b] I just hated the ending. `I mean, I knew it was coming, it was obvious, but it still made me cringe. Why couldn’t she be healed through acceptance of reality and love, instead of returning to her fantasy life. Depressing. the world didn’t end! I come from the (not so distant) future! and with that, it’s only logical that there is more to this series!!!! Well of course, with an anime this great I was really hoping for a second season. But I did a bit of research and it seems that there are only 2 novels (although I don’t know how much the anime covered) and there is no indication that a new release will come. The significant thing though is that Dekomori (best girl for me btw :)), Kumin, and even Rikka’s sister who are all major part of the anime are not included in the novel. They are all anime originals. So does that mean they don’t need the novel for them to create a second season? I was not expecting this out of this particular anime at all, and as such, I’m absolutely overwhelmed. What a great ending to a beautiful miniseries. Yuuta’s World Banishment really shook me to the bone :O Thanks URW for subbing this great anime! will fate/zero be released this month? Once again you guys did an amazing job. Thank you for picking this up and for working so diligently. Hey guys, plans for specials? i think the italics are on the wrong word, if i remember correctly. Thanks again and I hope you’ll keep up the good work in 2013! i know the answer to the question i’m about to ask is likely to be no, but i’ll still ask anyway: will you guys at UTW continue to do the recent OVAs and perhaps future ones if any ? and are you still in touch with Rori subs as well ? Well, I have a question. I love the ED so I downloaded the full version and I was wondering if you guys have a translation for the it. There are other translations of Inside Identity (the full 4:22) but their translations are sub-par compared to the translation here. If anyone knows please let me know (also the translation for Outsiders [basically the whole two songs in the inside identity album]). This series was wonderful. Thanks for the amazing subs. I don’t think it takes months to typeset signs. Either do it or officially drop it. Any more progress on the OVA?